FULL Dice Tower Spoilers for Deadpool Dice Masters! When I were a lad, getting started with CCGs and such, I used to play Magic: The Gathering. (I’ve still got some 3rd & 4th Edition era cards knocking around in a box somewhere) and one of the first ever strategies I tried my hand with was a ‘Thicket Basilisk’ and the enchantment ‘Lure’. Since that day I’ve always had a soft spot for cards with similar game-texts. ‘Medusa – Tangled Up’ is one such card. Firstly; she is an example of the new ‘deadly’ keyword, which is described as follows in the cards game-text: “At the end of turn, KO all character dice that were engaged with this character”. You can see why I was reminded of the Basilisk. ‘Deadly’ game-text appears to be a bit of a theme in the Deadpool set and we’ve had other cards with similar game-text in earlier releases too. If we wanted to use such an effect we might be able to find more favourable characters in terms of fielding cost or stats, but the second reason she caught my eye was her secondary game-text: she can simultaneously block two characters. The more I think on it, the more potent that seems. In this current meta a card that can block multiple attackers is highly advantageous, but to guarantee they’ll be KO’d at the end of the turn is just tremendously helpful. I’ll definitely be experimenting a bit with ‘Medusa’. This is a cheeky little card that definitely got me to thinking. Time will tell how useful ‘Outlaw’ becomes. She’s not very cost efficient, and you’ll need a KO mechanic to get some good use out of her, but I reckon she’ll be fun to play. A three cost Mask character with swarm and a mechanic that pushes his dice from the Used Pile to the bag? Yes please, that sounds like fun. Like many of the cards that caught my eye; his fielding costs are a little bit concerning, but he’s got an intriguing enough game-text to warrant some consideration for casual play at least. He’s certainly got the edge on the ‘Skeleton’. I’d also be curious to see his other rarities and whether they retain swarm with other secondary game-texts. Not one specific card to highlight here, just a note to express my pleasure that a number of affiliations are getting a little boost to their ranks that could make them more viable themed teams. The spoilers show that ‘Guardians of the Galaxy’, ‘S.H.I.E.L.D’, ‘Thunderbolts’ and ‘X-Men’ all have new characters to join the fray. How much more viable these new characters make themed teams based on the affiliations is yet to be seen. There’s only a handful of these affiliated cards that we’ve seen all rarities for, and those we have seen all variants of are not setting the world alight (except in particular circumstances), but both this set & GAATF indicate a much needed re-focus on previously established affiliations. In any case – it’s a positive trend in the game and one I am encouraged to see. Not the greatest choice of stand out card here, but I wanted to have a character on my list for this spoiler article that was an example of the new ‘Back for More’ game-text. Any card that provides a cheeky pip of damage to soften the ground is always fairly handy, and this new mechanic where the game-text initiates when the die is rolled from prep is definitely one I’m keen to experiment with. Fielding cost aside (how many times have I referenced the high fielding costs in this post? A bit of a trend with this set maybe? ), what a great piece of BEWD fodder this guy makes. KO him, make a discount purchase, then re-roll him next turn to deliver some damage. (It’s not very cost efficient, I get that) Or maybe pair him up with ‘Rip Hunter’s Chalkboard’ for some guaranteed ping. Or throw an ‘Escape Incarceration’ in the mix to make interesting use of him in a draft. It’s a great new game-text to experiment with and I’m looking forward to trying out guys like ‘Miquel O’Hara’ to see what interesting stuff comes out. 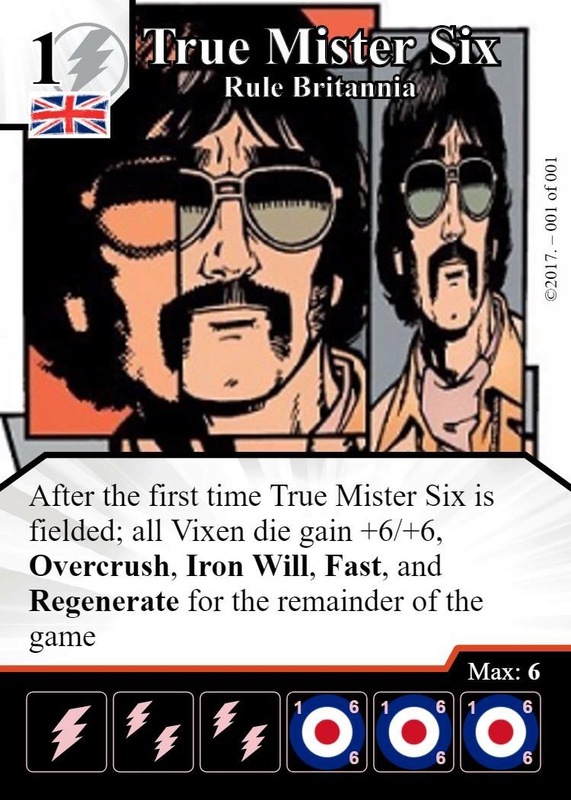 There we go then; my commentary on the new Deadpool Dice Masters set spoilers. I have to say that I don’t consider this set as meta-shaking (when compared to Green Arrow and The Flash) with what we’ve seen so far and eagerly await sight of the cards we are yet to see. That said; it definitely looks like it’s going to make for a tremendously engaging set to draft with. I would recommend the 2 cost morphing jar if you like outlaw’s card. It was my go to character on my ring team until elf thief came out. Y’know- you get so wrapped up in one rarity. of a card you forget about the others!